The holidays are so much fun, especially when the 5 Days of Christmas Ornaments are here! This years series is a lot of fun and all about … feet! 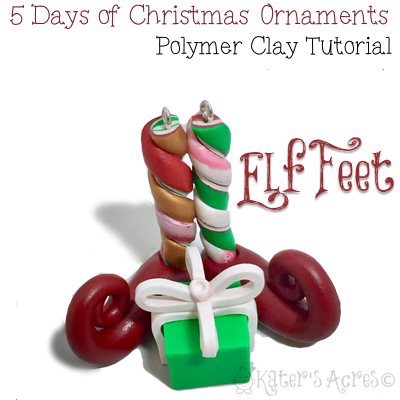 Today we bring you another cute ornament with Elf Feet. Cut two slices from the stack. Twist each of those slices to create to twisted tapered logs. Cut two red round 1″ rounds from a sheet of clay rolled on the largest setting of your pasta machine. Roll each into long pointed teardrops. Press the twisted logs down into the teardrops. Roll up the pointed ends of the teardrops to make rolled up boots. Add tiny screws into the tops of the legs. Press boots and legs together. Add a present between the boots if you’d like.